My late colchicum shipment from Daffodils and More was well into bloom by the time I finished dragging my feet and placed an order. I guess I didn’t elaborate enough on how these little guys work…. I thought everyone was obsessed with colchicums at this time of year! 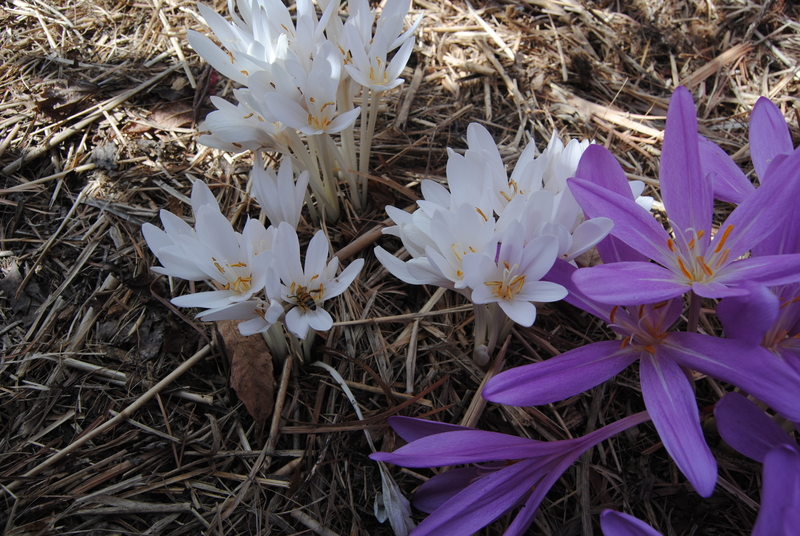 Colchicums are one of the “naked lady” bulbs that bloom in fall, they come up out of the dry autumn soil and surprise you with bare flowers minus the greenery. They grow their hosta-like leaves in the spring, just like other hardy bulbs, but the blooms wait till late summer before even thinking about showing up. 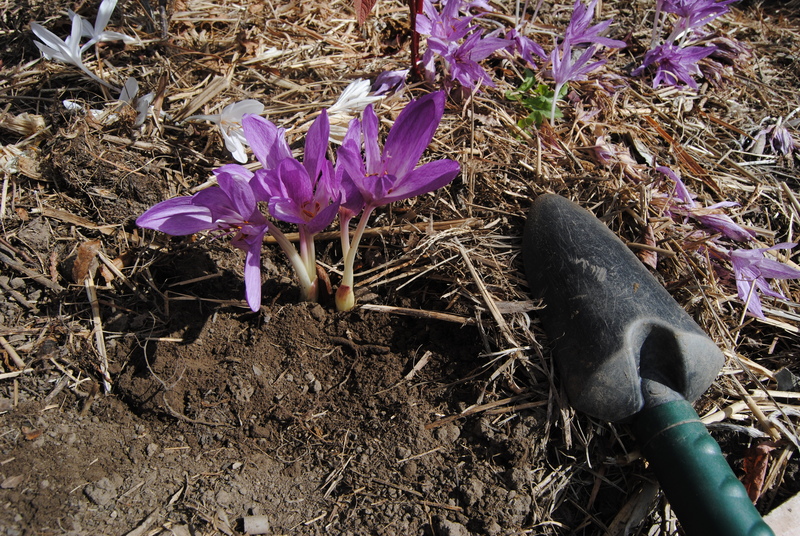 Colchicums are on their own schedule and if you’re a little late in getting them in the ground they’ll ignore your tardiness and go ahead and bloom anyway, soil or no soil. No problem, since the fall rooting will just wait until the bulb returns to the damp earth before it kicks in. This is how the bulbs looked coming out of their paper shipping bags. The bulbs I received were perfect, they had all been stored upright so that the floral tube came straight up and the separate blooms sprouted normally from within the tube. If the bulbs are stored willy-nilly the blooms come out all over the place and are a pain to plant properly. If grown normally a bulb forms a ‘heel’ where the roots sprout from, and a tube which brings the flowers to the surface. This bulb was planted last week and you can just start to see tiny roots growing… Sorry Annette, I just had to dig one up again to take a look and a photo! Once planted nothing much seems to bother colchicums. The run of the mill garden types thrive in average soil and full sun to part shade and pests usually don’t bother them outside of slug attacks on the blooms. 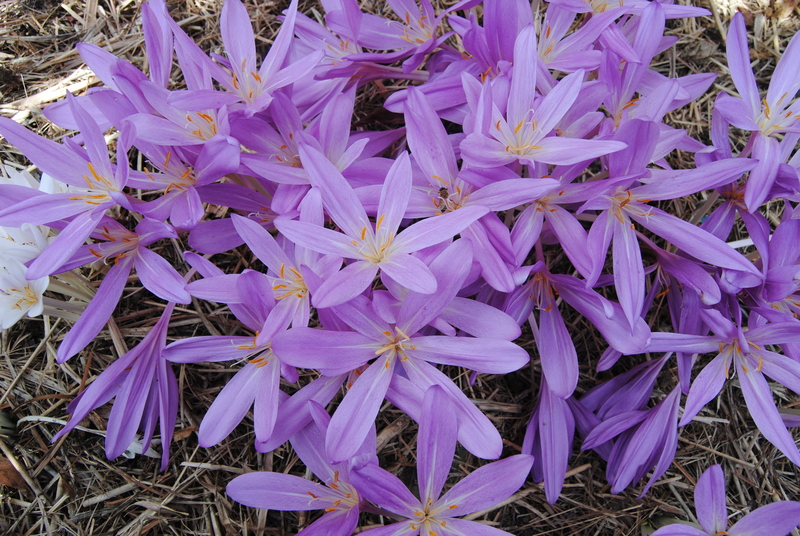 Colchicums are in fact poisonous enough to cause a nasty end to gardener or gopher and the same compound that protects them from chewing rodents and grazing rabbits is also the original source of colchicine, which is used to treat gout. In the gardening world, colchicine is also the chemical treatment that will cause seeds to go into polyploidy (doubled and tripled sets of chromosomes) when the cells begin to divide. Tetraploid daylilies are the best example I can think of, but a quick online search shows many others. Maybe my colchicum obsession isn’t as much selfish plant lust as it is just plain old gratefulness to a bulb that keeps giving! With the exception of a single recently dug bulb, my new colchicums are already settled into the colchicum bed. One of their neighbors is colchicum speciosum, a vigorous, long blooming bulb. I’m thinking of giving the colchicum bed an overhaul. The bulbs could use more elbow room and the display could use some background plantings a little more colorful than the drab mulch I threw on there this summer. 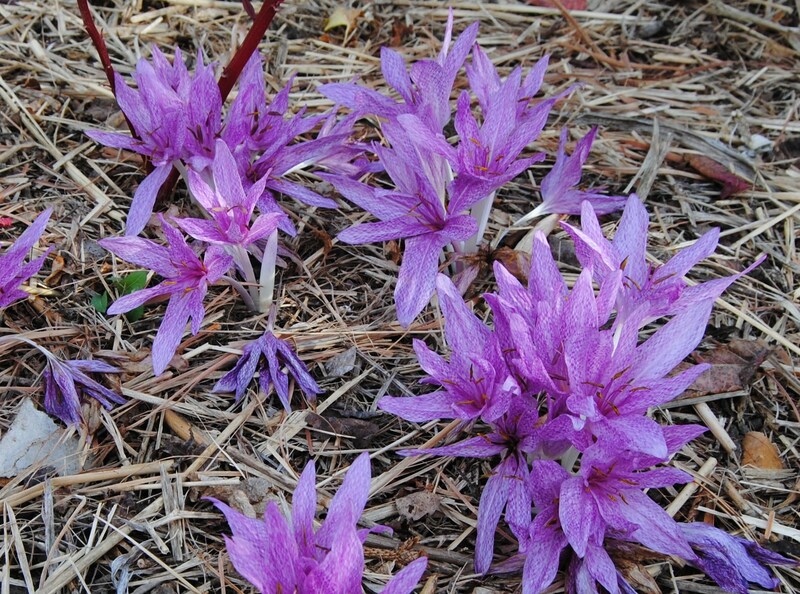 Susie over at pbmgarden got me thinking this summer about groundcovers and I think I have the perfect plan for at least a clump or two of the light pink colchicums. I want to divide up the blue leadwort (Ceratostigma plumbaginoides) and spot a few colchicums into that. Here’s where I have it right now in the front yard. It makes a halfway decent groundcover with a long season of gentian-blue flowers and green foliage. The leaves take on red tints with the cooler weather and the fact that it sprouts kind of late in the spring makes it an even better companion! Just one more thing before I’m completely done with colchicums. The word is ‘tesselation’ and it describes the geometric patterning some colchicums show. Colchicum x agrippinum has plenty of this checkering and it’s one of my favorites. This entry was posted in colchicums, fall, perennials and tagged colchicum blooms without soil, colchicums, colchicums blooming before planting, daffodils and more colchicums, fall bulbs, fall flowers, planting colchicums. I’ve had the leadwort for about three years and it’s only now just starting to spread. Three or four new plants came up this year (from runners maybe?) and it spread a little but so far nothing that can’t be easily controlled. It is deciduous though, so there’s some bare time in the spring. That sounds manageable then. Thanks! You hit on why I don’t let installers plant some plants without me present on site. Too often they plant too deeply and it kills the plant. Most installers don’t do bulbs like colchicum and would never even know. Heck, they can’t remember on iris either, no matter how many time I ream them out. Your bed looks lovely and next year, even better. Plants are usually pretty forgiving, but sometimes…. it’s too easy to do the wrong thing. I wonder if with unlimited resources (money) I could turn over all the planting to a hired hand? I guess I could let go some of it, but what would be the fun in that? Actually come to think of it, I would have no problem giving up hole digging and dragging pots around the yard, and it wouldn’t hurt to have someone to keep track of and clean up all the tools that end up scattered everywhere. I do all my own garden maintenance, but can get the crew here if I want at no charge. They are always too tired from client properties, that they are not so “good” when it comes to my place, so I just do it myself. I end up with missing perennials if they do spring and fall cleanup. What a great post! There are so many plants in the world to try and alas, so little cash. I think I have decided that when the reno is finished and I can plant in my not-a-cloister, I will plant colchicums, crocus, and zephyranthes in a carex lawn. Irresistible. Also, I’m working on my cyclamen list. Haven’t forgotten! Ahhhh. Money again. It’s a bother for me too and that’s without a reno (which always seem to take on a life of their own!). A carex lawn sounds cool. Some day when the yard here gets a little more refined I might be able to carve out a spot. We could trade colchicums for carex! Yes! I like that idea. anything new and beautiful in the garden…gorgeous photos. thanks! Good point, I know the autumn foliage is full of color too but you’re right that these blooms are a different kind of color. One that’s new and fresh, not one that’s a last call of the growing season. thanks for dropping by! I don’t grow these but you make me think I should. The C. speciosum are beautiful! And I didn’t know that about colchicine. A very knowledgeable and interesting post! Oh, and I agree about plumbago being an excellent groundcover. I don’t know why I waited so long to finally try the plumbago, I’m glad I did. For some reason it’s so much easier to collect the earlier, bolder plants than the late season, reliable stuff. What you call C. speciosum looks like ‘Lilac Wonder’ to me. But then, I have ordered C. speciosum at least twice, and don’t think I’ve gotten the correct item yet. I have heard of others interplanting plumbago with colchicums, and it worked well for them. I think you’re absolutely right! I bought lilac wonder last year and thought they looked remarkably similar, LW started to bloom a few days earlier but that could easily come down to location differences. My ‘giant’ is also something else, I’ve heard that colchicums are mixed up in the bulb trade but thought that was for everyone except me! Lol, come to think of it my c bornmulleri and Byzantinum are likely wrong too. Add those to the growing list. Good thing I love all of them and there’s plenty of room in the meadow garden. Dave Burdicks bulbs are the best and he has a great selection! Your idea of planting the Colchicum under a cover of Ceratostigma is brilliant! We have them coming up through some Lamb’s Ears which also looks lovely. Hi Amy! The lambs ears is a great idea, I think the pink and gray will look perfect. I’ll use a strong grower like my newly identified lilac wonder to push up through all the ears and it should be fine. Hi Frank, what a delightful and well researched post – thank you for that! And also for digging one up and taking a picture ;). They seem quite forgiving creatures. I actually like them growing like you do in this bed with the mulch (honestly! ): Thus their beauty can be admired without any distraction. Maybe that’s why I prefer to seem them in grass or generally a natural setting. They sort of look out of place in a mixed border, my humble opinion. The tesselation looks very pretty. Have a good weekend. It’s a summer weekend here, hot and humid August weather and nothing close to feeling like fall…. And still dry. Good to hear from you! I do like to keep them all together in the bare bed, it’s like a picture frame where I can examine them from first sprout to full bloom without any distractions! Once they multiply I divide and place a few in the flower beds… You’re right about them looking out of place in a mixed border. I’m going to try placing them in the plumbago and the lambs ears and see how that looks, otherwise I’ve only ever liked them in the bare earth under shrubs or planted in short grass…. But green grass would be far nicer than the brown turf that surrounds mine. 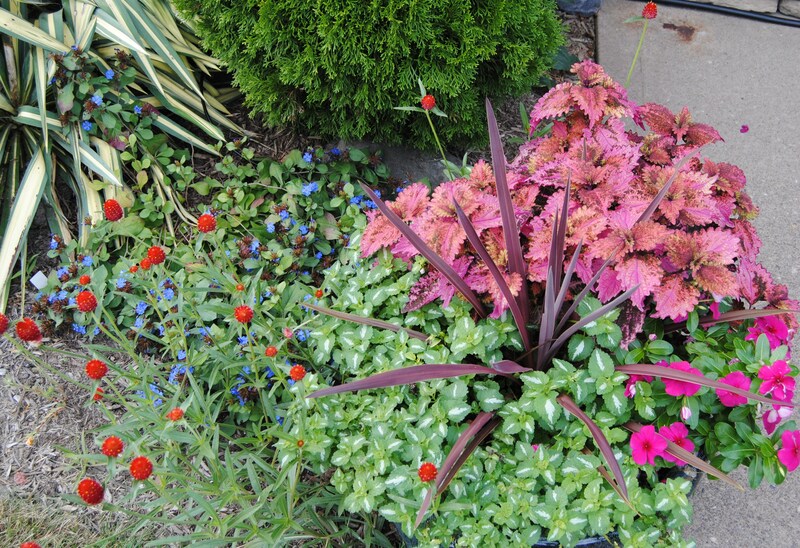 Yes, I think they’d look nice under shrubs or trees …wonder though whether they continue to thrive if it’s too dry? First ones started to bloom in our field, a pretty sight. They don’t seem to mind a dry summer, but spring is a different story. Last year I only had a few blooms in the main bed and blame a warm very dry spring for the lack of flowers. This year they’re back but still a little thin, I’m hoping they will recover fully next year!